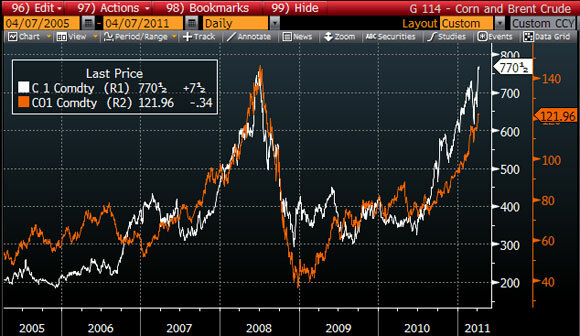 Good article on corn this morning by Smart Money Europe (Zero Hedge link). This chart is truly ugly. 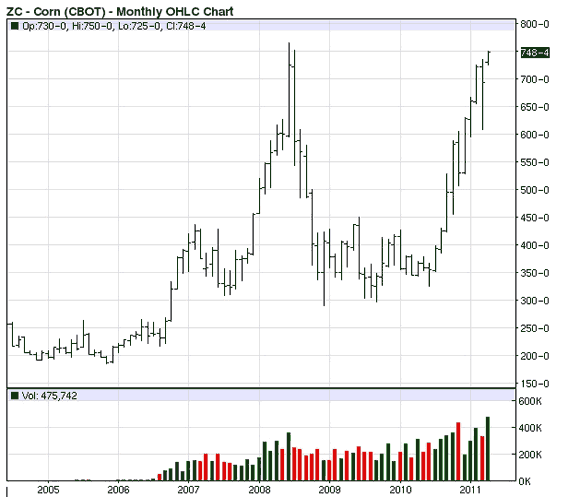 Looking at this it hard not to conclude that Corn = Crude as far as directional price moves go. Which is the dog and which is the tail? I think crude drives corn. It takes a bunch of energy to grow corn (diesel and fertilizer). There is also the ethanol connection. The higher the price of gas, the greater the price for ethanol, the greater the price for corn. The conclusion is that the dog (crude) is wagging the tail (corn). But that is not what the chart says. Over the past four months corn has outpaced oil. In the past quarter the tail has been wagging that dog. One of two things will happen. Either corn corrects or crude corrects. My bet? The dog will catch up with the tail. This chart is telling me that $140 Brent is on the way.